Sydney Shop Girl: Life This Week 11/6/2018: The M - Z of Me! Picking up where I left off in my companion 'A-L of Me'! post. 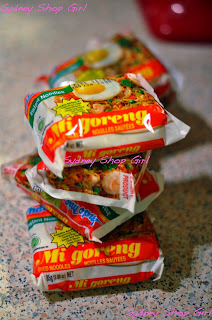 Mi Goreng. With an egg, with carrots or bok choy, with extra fried onions, with some leftover supermarket roast chicken and even meatballs. So many possibilities and they're all unfailingly delicious. It also has to be the IndoMie brand for me. I've tried the competition but they don't even come close. Notebooks. Writing something down in a Moleskine (even in my illegible handwriting) makes it stick in my memory. I also like being able to read things over in a hard copy format that allows me to highlight and annotate as I go. It's not quite the same trying to take notes on a laptop or on a smart phone. Online. It's a clear winner over bricks and mortar when it comes to shopping for me. I've discovered some wonderful etailers all over the world and the online service for many of my favourite stores is that much better than what's on offer in their physical stores. Planes. My preferred mode of long distance travel. I'm not patient enough for trains or cruises. I also love the excitement of the airport and the sense of anticipation I feel whenever I enter one. Quarters. It's pretty obvious from my blog and Instagram that I love visiting the United States. It's a land of diversity, great beauty, contradictions, brashness, a sense of anything (good or bad) being possible across its vastness. No two visits have ever been the same for me despite the little routines I have for my travels there. I have this passion for getting those morning Ks in that others hold for the piano, the opera or painting. I see beauty (or at least a sense of achievement) in total kilometres run, elevation percentages and split paces. What can I say? Different strokes for different folks. Sunrise. Being a morning person, I'll have witnessing a sunrise over a sunset any day of the week. There's a freshness to the air and a stillness to it too. They both promise a day ahead that will contain at least one or two good things. Tea. I live for those mornings where I can laze in bed with a cuppa as I read and scroll. And afternoon tea with a luxurious pot of freshly brewed tea is a treat I don't enjoy often enough. Umbrellas. A fact of life in Sydney for most if not all seasons of the year. Vistas. Defined as 'a pleasant view' or 'a long narrow view as between rows of trees or buildings'. Life so far has given me plenty of visuals that fit both definitions. I'm so fortunate to have the opportunity to seek new ones at frequent intervals between the responsibilities of work and family. Watches. Like perfume and my favourite jewelry, I never leave the house without one strapped to my wrist. I like knowing the time (and the date) when I'm out and about. Actually, it's a bit more than like, it's 'must', more accurately. X-rays. I look at them daily at work. These days they're all on computers like most everything else in the world. Sometimes a kind radiologist puts green arrows and measurements directly onto images for me. It's strange but I do miss that slightly mystical old world of actual films that we had to slot onto viewing boxes (and hope that we both got a series displayed the right way and the right order as well as that none of the films would fall out of their holder on the viewing box). Yoga. It's therapeutic for both my mind and body. I only manage half an hour every other day at home but it does wonders for me and I feel it badly when I fall off the wagon. Zoo. Taronga Zoo is a place I've discovered because of Master SSG and I think I now love it more than he does. It's the kind of place you can dip in and out of depending on your mood and the weather. Getting there is an adventure in itself, it's a pretty special ferry ride and then sky train to get to the zoo entrance. None of which will ever get old for me. I always pause to say hello to the giraffes before gazing beyond them to the Harbour Bridge. Pick a letter. Any letter between M and Z. What's a word that begins with that letter that describes you? Right now the word that describes me would be tired, ha! I like this post, lovely way to get to know more about you SSG. I do like a sunset, but not so much the waking up before sunrise. Pretty unavoidable now it's winter though! Ok, so I don't get the running thing, but I do like to get the early morning walking ks in - as you say, different strokes and all that. There's something about early mornings & sunrises that is so hopeful. And yep, happiness truly is a new moleskine and a cup of tea. We do have lots in common SSG! Notebooks, excitement about airports and flying, running, tea, yoga and Taronga Zoo. We would always visit there on School Holidays when I lived in Sydney. Have a great week! I commented and wrote some great stuff but it didn't stick coz I was in as wrong "profile". Sigh, Anyway, I was here and I read and now I'm going to copy and paste this comment to everyone else's posts that didn't stick. LOL. I love Taronga Zoo. One of my favourite photos was taken there. I'm a cuppa tea girl, too. Wish I could say the same about mornings and running. Go,you! I wish that things stuck in my mind when I wrote them in a notebook. I am totally with you when it comes to online shopping. If I can't order it online, it's not worth having. Loving these posts. I adore notebooks, although, I am using cheap ones from an online journal shop because I paint and stamp and make a general mess and can't do that to a Moleskine! Love the X-Ray comments, it's always funny to think how many things have changed (processes and habits) because of computers. I never even considered x-rays! That was such a lovely read. I am a Moleskin fan BIG time too. I use a mini story board and a large story board because I can do a pattern or illustration and write too. When I came to Sydney for surgery in Feb my go-to MUST was Dymocks as the stockist I had used when we lived in Sydney and booooo they only had one size. Then I found book depository stocks them. Prices were excellent too. The Zoo....with a child is one thing but I reckon by yourself is also a great place to explore. Loved reading your M-Z. Xrays...we still carry around a set of these HEAVY things...makes me wonder why! ?